Piano Adventures® Player puts serious fun in the palm of your hand! Nancy and Randall Faber are pleased to introduce a new mobile app that offers the convenience of a full MIDI player on your iPhone or iPad. 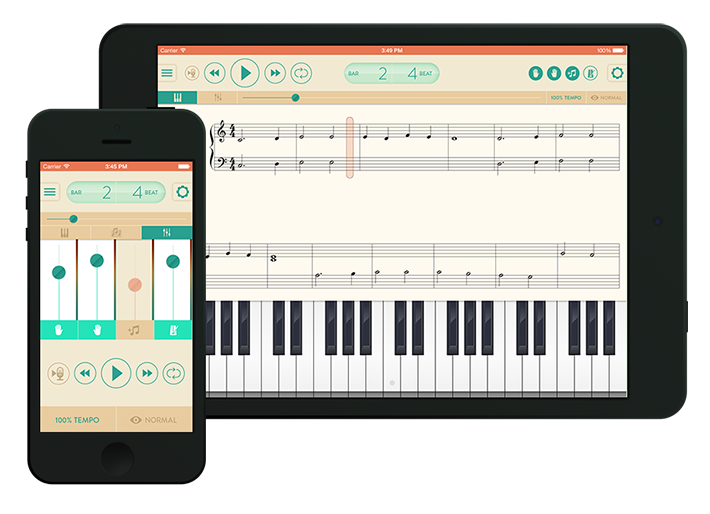 The app provides easy access to interactive play-along accompaniments for the Piano Adventures method books—bringing an orchestra, jazz ensemble and rock band right to your mobile device. The user interface is elegantly designed, appropriate for all ages and instructional levels. Digital sheet music with play-along tracks for 11 songs from FunTime® Piano Hits (Level 3), including blockbusters by Ed Sheeran, Lady Gaga, Justin Timberlake, and more! Digital sheet music with play-along tracks for 63 Popular songs at all levels, including: Star Wars, Thinking Out Loud, Hedwig’s Theme, 100 Years, Pirates of the Caribbean, the Beatles, and more! Digital sheet music with play-along tracks for 72 Classics at all levels, including great symphonic and operatic masterworks by Bach, Beethoven, Mozart, Mendelssohn, Tchaikovsky, Vivaldi, and more! Digital sheet music with play-along tracks for 79 Christmas songs at all levels, including: Jingle Bells, Joy to the World, Rudolph the Red-Nosed Reindeer, Frosty the Snowman, Carol of the Bells, O Holy Night, and more! We have received many requests for an Android version of the Player app. We enjoy and rely on our Android devices, too, but we made the decision to develop for iPhones and iPads first. Please visit our FAQs page for more information and links to recommended solutions for Android users.